This weekend my boyfriend obliged my desire to treat him like a real-life Ken doll and let me take him to a black barbershop for the first time! Since this was his first time going to a black barbershop, I took the lead and made his appointment with barber (and Seattle Barber owner) Glen Charles. He'd been growing out his hair and beard for the appointment, and it proved a great canvas for Glen to work his magic. Seattle Barber is a dope shop located in the heart of Seattle's Capitol Hill Neighborhood and caters to ALL hair types. What impressed me most, besides Glen's skill as a barber, was the diversity in his shop. I saw a White, Black and Asian barber (not including Glen) and his clientele reflected that same diversity. 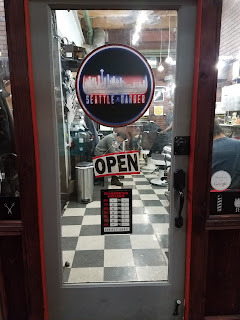 It's really cool to see a shop that mirrors the diversity of the neighborhood it's located in, as well as being able to offer men of all backgrounds a great cut. Literally ANYONE can walk in and trust that Seattle Barber is equipped to handle their hair type. I know this isn't the biggest issue for my boyfriend, but as a black woman I know the struggle of having to call around and see if a salon can do your hair. With the constant stream of transplants moving into the city, it's nice to know Seattle Barber can take care of you. Funny Story: While my bf was getting his hair cut, someone called the shop and asked Glen if they could cut black hair. He chuckled before saying yes. Listen folks. The struggle is real for people of color. Cuts range between $23 to $28 with beard services being an extra $5. 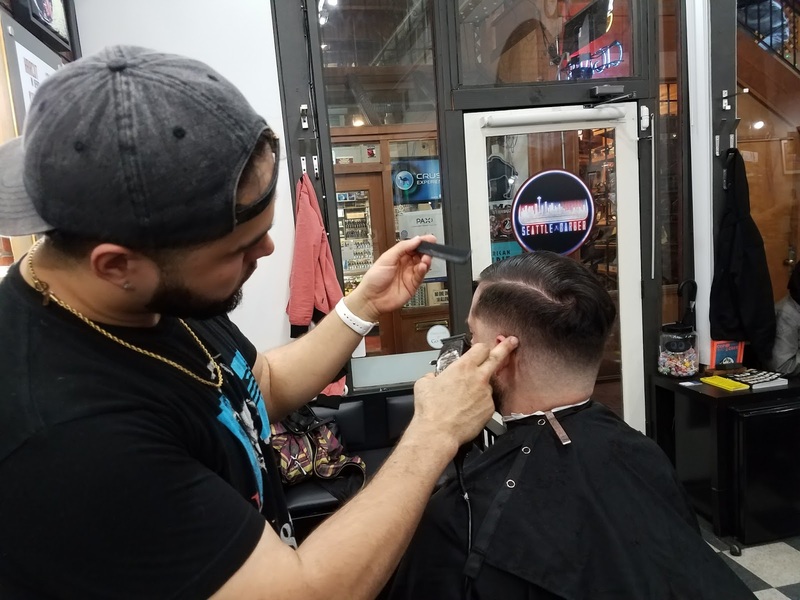 Walk-ins are accepted, but let's keep it real -- you're better off making an appointment with the barber of your choice. If you'd like to get in with Glen, he recommended booking your appointment a week out via text. 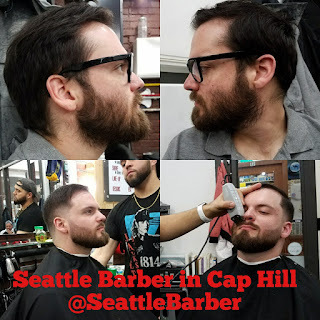 Seattle Barber is open Tues-Sat from 12p to 7p and is CASH ONLY!!! For more information about Seattle Barber, check out their Instagram or Yelp Page. They currently have 4.5 stars (out of 5) with over 30 reviews.